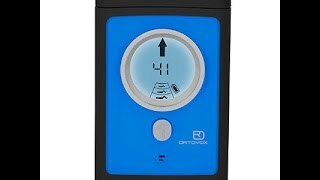 With the Ortovox 3+ Avalanche Transceiver, you are able to search with confidence! The patented SMART-ANTENNA-TECHNOLOGY – with intelligent position recognition automatically switches to the best transmission antenna. The Ortovox 3+ is equipped with all the features of a modern, digital 3-antenna avalanche transceiver. The illuminated real-time display tells you the direction, distance and number of victims. The patented circular display, combined with the intuitive search acoustics, leaves no doubt when operating in fine search mode. Once located, victims can be removed from the display using the flagging function. The motion-sensor-based follow-up avalanche switchover ensures additional safety. Ortovox has also thought about the future: the Ortovox 3+ can be updated and protects the environment with just a single battery. The Ortovox 3+ is a three-antenna device with a special extra function to first enhance your own safety. The intelligent position recognition system analyses the position of the antennas and automatically switches to the optimal transmitting antenna. There is no longer any such thing as the ‘worst position’. The circular display lets you focus on the essentials. The distance to and the relative position of a victim. Always align the device with the arrow. The solid arrow and the central distance value keep you going in the right direction. The patented circular display shows you at a glance whether you are getting closer to the signal or moving away from it. With the precise distance value, you can very effectively determine the distance to the buried victim and limit the area to be probed. The Ortovox 3+ allows you to maintain an overview even with multiple burials. The number of victims is shown on the display. As soon as you have found the first one you can blend out their signal with the pin key. The victim is displayed as pinned and you can immediately continue with your search. Smart antenna technology enhances your own safety. Signal separation with the pinning function. Very easy operation due to clear control elements, precise real-time display with directional arrows and circular display. Rubberized housing for protection and ergonomics. Display lighting for night searches, switchover in case of a follow-up avalanche, clear and optimized search acoustics, updateability.